"Hearing about and glorifying the Lord are identical with the transcendental nature of the Lord, and by so doing, one will be always in the association of the Lord. This brings freedom from all sorts of fear. The Lord is the Supersoul (Paramatma) present in the hearts of all beings, and thus by the above hearing and glorifying process, the Lord invites the association of all His creation. This process of hearing about and glorifying the Lord is applicable to everyone, whoever he may be, and it will lead to the ultimate success in everything in which one may be engaged by providence. There are many classes of human beings: the fruitive workers, the emperic philosophers, the mystic yogis, and ultimately, the unalloyed devotees. For all of them, one and the same process is applicable for achieving the desired success. Everyone wants to be free from all kinds of fear, and everyone wants the fullest extent of happiness in life. 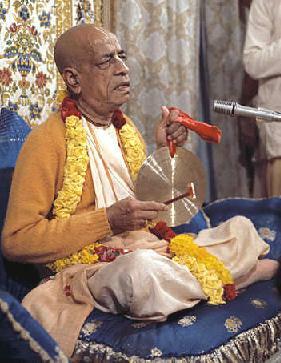 The perfect process for achieving this, here and now, is recommended in the Srimad-Bhagavatam, which is uttered by such a great authority as Srila Sukadeva Gosvami. By hearing about and glorifying the Lord, all a person's activities become molded into spiritual activities, and thus all conceptions of material miseries become completely vanquished."